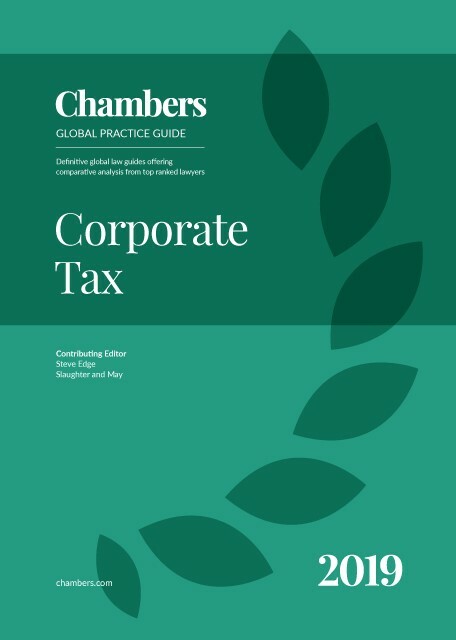 The Corporate Tax 2019 guide provides expert legal commentary on key issues for businesses. The guide covers the important developments in the most significant jurisdictions. Slaughter and May is a leading international law firm with a worldwide corporate, commercial and financing practice. The highly experienced tax group deals with the tax aspects of all corporate, commercial and financial transactions. Alongside a wide range of tax-related services, the team advises on: the structuring of the biggest and most complicated mergers and acquisitions; the development of innovative and tax-efficient structures for the full range of financing transactions; the documentation for the implementation of transactions so that the desired tax objectives are met; the tax aspects of private equity transactions and investment funds from initial investment to exit; and tax investigations and disputes from opening enquiries to litigation or settlement. In preparing the introduction to this excellent publication last year, I said that tectonic plates were on the move in global tax. This year, it could be said that we are in the middle of a political and fiscal earthquake. This is not the place for any commentary on the political situation on both sides of the Atlantic (and elsewhere of course), but the political background is obviously influencing tax developments as countries compete with each other not only for revenue and investments, but also in terms of responding to public sentiment relating to corporate tax. Business and corporate restructurings aimed at addressing issues raised by the changing tax world abound. Consequently, many people will find this publication useful in addressing what the impact of any restructuring may be, looking at how cash flows through a group may be affected and generally trying to assess the impact of changes that are being forced upon them by circumstances. In light of this, the following introduction highlights a few areas or particular significance. The US has not, of course, moved to a full territorial system. GILTI is going to be a puzzle until all the relevant regulations are released. BEAT is causing problems because its political agenda (to encourage people to bring activities back to the US) really has nothing to do with base erosion in a BEPS sense. Many groups that are faced with restructurings of how they organise their R&D activities or obtain cross-border IT or administrative support will conclude that there is no great tax logic behind BEAT. It was, of course, always inevitable that something that was forced through in such a quick-fire way was going to be a bit rough around the edges – not only generating uncertainty for taxpayers and business (which is not good) but also requiring legislators to catch up with retrospective rules as they start to realise the full impact and implications of what they have done and the loopholes/problems created. This space will have to be watched for a good while yet. At the time of writing, the outcome of the Brexit process is still far from clear. The UK financial services sector seems to have survived reasonably well (showing once again how important business mass and infrastructure are) but there is no doubt that the uncertainty of the outcome has caused problems for banks and others trying to predict and cope with potential changes to their business models. In the corporate sector, the fact that many countries in the EU have restricted changes designed to deal with fundamental freedoms (such as Cadbury in the CFC area, or the ability to create tax groups through intermediate offshore holding companies) by reference to EU companies means that people investing into the UK (as the fifth biggest economy in the world) are facing problems that could have been avoided by these countries being, as the UK has been, more generous and global in their changes. Whether pressure from each EU member state's local multinational base to extend reliefs beyond the EU once the UK is no longer a member (if this is indeed the end result of Brexit) will be successful remains to be seen, but it is hoped that it will be. The UK as an international holding centre remains competitive in terms of its tax system (a proper territorial system, sensible CFC rules, reasonable relief for funding costs of onshore and offshore investments, a low domestic tax rate and no withholding tax on outbound dividend payments). It therefore remains an attractive location for UK-based multinationals and intermediate holding companies, but it has lost its former status as an access point to the EU from an island location off the shores of Europe. Whether the UK remains an attractive location for inward active business investment remains to be seen. Its low corporate tax rate (along with all the other facilities the UK has to offer in terms of infrastructure, etc) should certainly help. The UK’s DPT rules have been wrongly castigated in the US as extraterritorial. They are only that in very limited circumstances. A better description would be that these rules toughen up the existing transfer pricing regime, with severe penalties for those taxpayers who are not co-operative, and that they help HMRC to put UK-taxable profits in the context of global operations and value-add. The UK has changed its rules designed to impose withholding tax on royalties paid to tax havens for IP located offshore, and turned them into direct income tax charging provisions. The full detail of these rules has yet to be fleshed out, but they seem inclined to encourage business restructuring (so that there is less 'stateless income') rather than to collect revenue. The proposed Digital Service Tax (directed at those who create a digital market space in the UK by making money out of putting other parties together) has attracted widespread criticism from the US as a thinly disguised attack on specific companies, but surely has more merit than the other proposed solution of attributing residual profit to the marketplace where consumers are located. This flies in the face of logic in a commercial world where little value would be attributed to sales operations. More work needs to be done, but while destination-based taxation, like any other unitary system, is an answer, it is not the right one. It is difficult to see a global solution that changes the allocation of taxes between countries bring found here, so a robust and philosophically justifiable patch over the current rules may end up being best. Quite what the EU agenda for tax competition is remains to be seen. There is, of course, logic in the European Commission preventing governments giving aid through the tax system that, if paid directly, would be illegal. It has felt in recent years, however, as if the Commission was on a more general crusade against tax competition – though the recent McDonald’s case has established that not all low or nil taxation constitutes state aid. In the meantime, there will continue to be tension in this area. This continues apace whilst some groups still struggle to assess the full impact of things like the anti-hybrid rules. Where the OECD goes next again remains to be seen – they are obviously taking a great interest in the digital trading area. Overall, however, it is difficult to criticise the OECD for the job they have done. As in the case of US tax reform, they had an awful lot to do in a very short period. Without drawing any distinction with what has happened across the Atlantic, however, they have done what they had to do very well. The public clamour on multinational taxation seems much quieter now, and there is a feeling that much good progress has been made.